God is my portion, and my cup: God Is Always With Us Patiently. Don't Be Afraid. Ask! God Is Always With Us Patiently. Don't Be Afraid. Ask! Gideon was an ordinary person. God came to him. The angel of God found Gideon hiding in fear of the Midianites who oppresses the Israelites for seven years. God, who was merciful, waited and waited. The Israelites did not stop evil before God by serving their idols, which were nothing but things made by human hands out of wood, silver, or gold. The idols could not give anything to them, but they worshipped. They had mouths, eyes, ears, noses, hands, and feet, but they could not speak, see, hear, smell, feel or walk. They just stayed where they were placed. Even so, the people of Israel put their false hope: the idols would give them what they wanted. God allowed them to suffer. Their hardness of heart did not change quickly. After the seven years’ suffering under the Midianites, finally they started to cried out to God. To deliver the Israelites, God chose Gideon. Gideon met the angel of God, when he had never expected to meet an angel of God. He was a good man. Without knowing the angel from God, Gideon welcomed the angel, and he heard the angel. He also served the angel with his finest food. Then the angel of God revealed the power of God. Gideon realized that he met the angel of God. A terrible fear fell on him, but God comforted him. God gave him a mission to rescue the Israelites from the hands of the Midianites. Gideon looked himself. He was not strong enough to take the unimaginable mission. His clan was the weakest in the whole tribe of Manasseh, and he was the least in his entire family. He humbled before God, but God raised him up. Gideon built an alter to God, and gave thanks. 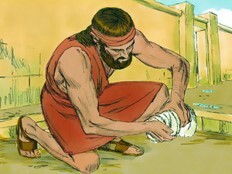 Gideon took ten of his servants and did as the LORD had commanded. But he did it at night. Although he was afraid of the other members of his father’s household and the people of the town, he did it. The following morning, the people of the town found that Gideon did it. They came to kill Gideon, and Gideon was hiding. The merciful God sent Gideon’s father instead, and protected Gideon. God saved Gideon who did the courageous acts of taking away the very source of the evil of the people – their idols: Baal and Asherah. God loved Gideon’s courageous act in faith. Although he did it in fear of the people around him, Gideon passed the first test, and proved himself before God. Gideon, in turn, experienced God, who was a strong hold for Gideon. 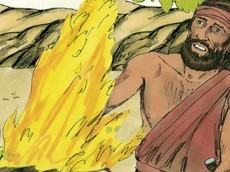 Gideon made the first, gigantic step in faith of God. He was ready for the next step in faith of God, which was even bigger. Soon the armies of Midian, Amalek, and the people of the east formed an alliance against Israel and crossed the Jordan, camping in the valley of Jezreel. A really fearful event was unfolding to the people of Israel. Although it was dreadful to the eyes of the people of Israel, it was a part of God’s plan for His children. Before the threat, the people of Israel complained, “we have enough pain for a long time. Why are we getting another one, which is even bigger than anything that we got?” They felt that the sky was falling without any hope. However, like a night is darker before dawning, the dreadful event was a sign for a new dawning set by God. God sent the Spirit of the God to Gideon, which took possession of Gideon. For this time, Gideon was different. He, who used to hide himself, was emboldened in God’s spirit. Gideon stood up as the solider of God in order to free the Israelites from the Midianite, the alliance of the armies of Midian, Amalek and the people of the east. Gideon blew a ram’s horn as a call to arms, and the men of the clan of Abiezer came to him. He also sent messengers throughout Manasseh, Asher, Zebulun, and Naphtali, summoning their warriors, and all of them responded. All were done by God’s spirit, in fact. Gideon saw the power of the God again. He was the least in his entire family, and his clan was the weakest in the whole tribe of Manasseh. Even so, when he blew a ram’s horn, and the entire people of Israel responded. He again saw the power of God. Again, he looked at himself. Nothing has been changed. Yesterday’s Gideon was still with him. Only was different the God, who was continuously transforming Gideon. Although Gideon clearly knew he was called by the Mighty God, before the daunting task, he felt that he still needed additional God’s help to increase his faith. He approached to God, and authentically asked for his help. Gideon prayed to God, “If you are truly going to use me to rescue Israel as you promised, prove it to me in this way. I will put a wool fleece on the threshing floor tonight. If the fleece is wet with dew in the morning but the ground is dry, then I will know that you are going to help me rescue Israel as you promised.” God answered, and that is just what happened. Gideon Got up early the next morning. He went out and gathered wool fleece on the threshing floor where he met the angel of God. Then he squeezed the fleece and wrung out a whole bowlful of water. God heard Gideon, and answered his prayer. What a merciful God He was! However, Gideon was still cautious about what he experienced. He was still haunted by his past. He could see the old self in him, who was threshing wheat to hide the grain from the Midianites. Gideon believed God, but he was still in fear. Although he did the mighty act of destroying the Baal and the Asherah beside it, and he saw the people responded his ram’s horn blow against the armies of Midianites and allies, and the wet fleece, he was not fully ready for the daunting task. Thus, he asked God. If we were God, how would we respond? Getting tired? No. God was not. God was patient with Gideon and loved him. With courage, Gideon prayed to God, “Please don’t be angry with me, but let me make one more request. Let me use the fleece for one more test. This time let the fleece remain dry while the ground around it is wet with dew.” So that night God did as Gideon asked. The fleece was dry in the morning, but the ground was covered with dew. God answered Gideon’s prayer. Not like us, God is patient. It was not the only one example of God’s patience. God was truly patient with Abraham when he asked for God’s mercy for Sodom, the wicked city. Abraham asked God to save Sodom if there were fifty righteous people living in the city. God responded, “If I find fifty righteous people in Sodom, I will spare the entire city for their sake.” Then Abraham gave a thought. He felt that it would be hard to find fifty righteous people. He asked, “suppose there are only forty-five righteous people rather than fifty? Wil you destroy the whole city for lack of five?” God answered, “I will not destroy it for the sake of the forty-five.” Abraham, then, asked again for forty because he was not comfortable with the number forty-five. God said yes, He would save if there were forty righteous people in the city. Abraham returned to God again, while asking thirty. God said yes. He asked again with a lower number, twenty. God patiently said yes. 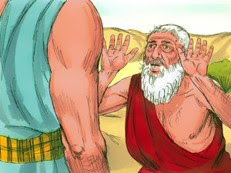 Abraham finally made a decision to ask once more, “Lord, please don’t be angry with me if I speak one more time. Suppose only ten are found there?” And the LORD replied, “Then I will not destroy it for the sake of the ten.” The God had finished His conversation with Abraham, and Abraham returned to his tent. 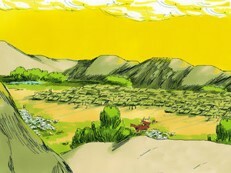 Abraham felt that it would be easy to find ten righteous people out of the big city like Sodom. Although Abraham was confident, it was not the case. The city did not have ten righteous people, which is less than one percent of the population. (It is estimated that the population of the Sodom at that time was around 1000. Then 10 people means only 1 percent.) Please note that God patiently answered six times until Abraham became comfortable. Yes, God is always patient to us. What we need is to authentically approach to God with anything including our deepest question especially about our faith in Him. He loves to answer our question. He always assures us with His love. He will not reject nor ignore our heartful prayer. Instead, He answers us with the best that is beyond our imagination. What God really wants is for us to authentically approach him without hiding anything in our heart and to tell Him everything and our heart, pain and desire as Gideon and Abraham did. If a child never talks to his/her parents authentically, then how do the child’s parents feel? They will be truly in pain. God is our ever-loving Father, who truly loves to hear from His children about all things that His children have in the hearts including joys, pains, concerns, fears, disappointments, and hopes. Just put out everything in our heart to Our Father, He surely hears our prayers one by one patiently and lovingly. This is our assurance in God.